I've been leading worship in the local church for the last 7 years. I would be categorized as a "contemporary" worship leader, because of my musical style. Taking two churches through style transitions, I've taken my share of hits. I'm so grateful for these experiences, because they've sharpened me and tested my motives. They've made me better. They were a huge part of my development. One of the frequent attacks that came my way was the complaint for not using hymns. What I quickly realized was that when they said "hymn", they were talking more about style. This became clear as I tried inserting more hymns to appease them, and still could not win their approval. In other words, these same people could care less whether I sang the lyrics to "Greensleeves" or "What Child is This?" as long as it sounded, to be blunt, old. This crowd wanted nothing to do with the new. Again, I'm past the bitter stage and well into the thankful stage. Through all of this, God showed me my purpose. I was to teach and train the church in worship through music. I was to help them see past the style and fall at the feet of Jesus. That is my purpose and passion as a worship leader and God has made it clearer everyday through the fruit. The flip side to this is the progressive crowd that has, in a sense, thrown the hymn book in the trash. They are caught up in their own form of legalism that says, "If it's not new, I won't use it." They want nothing to do with the old songs of the faith. What they're doing is continuing a cycle of legalism, that ironically, they're rebelling against. Meanwhile, churches and worshipers are being deprived of the main thing: WORSHIP. I love Jack Hayford's definition of a hymn: "A hymn is a song sung to Him." The balance we can find is that God doesn't care about the date of a song. He wants our hearts. As a worship leader, I basically have decided to blur the line that separates the old and the new. I'm looking to bring songs that are Biblical. Songs that will usher the crowd to worship God in Spirit and in Truth. I'm so grateful to finally lead a crowd that isn't thinking "How many hymns are we doing?" As I've said many times over the several years, I want to use inspired songs by inspired Christians from all generations. To throw the hymn book out like yesterday's news is just as bad as being close-minded to the new songs that our springing up today. Remember what it's all about. What's your thoughts? What's your favorite old hymn and why? Okay my dear!! I grew up in a Baptist Church and the hymnal was a staple. Most hymns are scripture inspired. You hurt my heart when I saw that hymn book in the garbage. Before Maranatha, hymns weren't direct quotes from the bible, but used as inspiration and solace nonetheless. 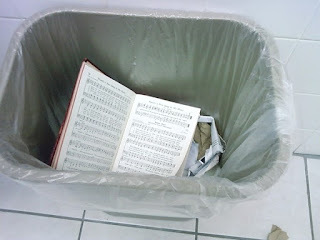 Please, please, take that hymn book out of the garbage! To me, it's like cutting up our revered American Flag! I appreciate the comment, but did you read the actual post? That was kind of my point. You know I love the old Hymns, and I love new songs too, as long as they are Biblical, Worshipful, and that they are God Centered (that could be a little ambiguous, but I think you know what I mean). Generally, when we do a song for the first time I don't sing it, even though I catch on pretty fast and could sing. Usually I read and/or listen to the words and think about them, watching to see that they meet the criteria listed above, not that I don't trust you, but I think we should all do such things. I have heard it said that we should stick to the old Hymns because they have stood the test of time. Well, there is an aspect of that which is 100% true. Certainly we shouldn't throw them in the trash because they are in fact songs that have survived, in some cases, for hundreds of years. That means that over time the bad ones have been weeded out, either because they just didn't work as songs, or because they weren't really Biblical and such things as that. The fact is that the Old Hymns were new once too, and if they hadn't been tried out back then, they wouldn't be around today. I guess my point is this: is it possible that some of the new songs don't stand up to the quality of the old ones? Absolutely, but those that aren't up to it will be weeded out over time, and should the Lord tarry for another three or four hundred years those of our new songs today that do stand the test of time will be the old songs, and some people will only want to sing them and will resist the new songs of that era. This is one of those issues that will never end... until the end. Thanks for saying what you did. I completely agree with you in it all. I, at one time, not too long ago, fell into that "legalistic progressivists." I had to realize that I was no better than the person who judged me for worshipping with a 4 piece band instead of an 40 piece orchestra. Getting down to it... I agree... Worship is worship, truth is truth. 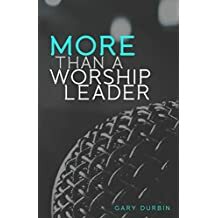 My "goal" in leading is for the heart to meet truth through worship in whatever style, form, arrangement, or sound and respond accordingly...reckless abandonment to our Savior. Hope that makes sense. Miss ya man! But Gary, what about those that just like to hold a hymnal? After all, Jesus used a hymnal, right? In all honesty, I believe that all music that is God honoring is useful. As long as it truly honors God! To me, I don't think that tradition should play a part in worship music. Hymnals aren't really the issue in many cases; it's simply holding on to the past. We need to stop holding on to the past, and embrace the future. There is alot of great music coming out of local churches that honor God just as much as our sacred hymns. Exclusive usage of hymns today negates God's hand in creating more worship music today and in the future. Speed, tempo, key, nor style matter as long as it lifts the name of Christ. Oh by the way! Legalism, as you asserted, goes both ways. Gary, thanks for this post, it was well said. I've always remembered hymns from my childhood, and the great spiritual truths they communicate. But I really love modern styles and lyrics that are in today's language, and use them in worship way more than older 'classical' hymns. Just like I read out of modern Bible translations way more than the King James. But all are valuable in their own right, and touch people in their own ways. I find that I write songs in this manner, in that most of the songs I write (the best ones anyway) have a timeless feel - the style works for today, but it's not so 'pop' that it won't work in 20 or 200 years, and the lyrics are often right from scripture and therefore timeless. This is no credit to me, it's just how God wired me as a songwriter. How blessed we are to be able to choose from the wealth of material available to us to worship God with. Let's take everything from every age (and every genre, and every culture) and use it to the glory of our great God!